Summary: What if you could live again and again, until you got it right? On a cold and snowy night in 1910, Ursula Todd is born to an English banker and his wife. She dies before she can draw her first breath. On that same cold and snowy night, Ursula Todd is born, lets out a lusty wail, and embarks upon a life that will be, to say the least, unusual. For as she grows, she also dies, repeatedly, in a variety of ways, while the young century marches on towards its second cataclysmic world war. Does Ursula's apparently infinite number of lives give her the power to save the world from its inevitable destiny? I've been sitting here for over an hour procrastinating on writing my review for LIFE AFTER LIFE by Kate Atkinson. One of the reasons is because I have read so many wonderful reviews for this novel and I know mine won't compare. However, the main reason that I haven't wanted to write my review is because LIFE AFTER LIFE just blew me away. I absolutely, positively loved this novel... and I know I won't be able to express my appreciation of this book in any sort of coherent manner! Before I try to summarize this novel, I have to warn you that I'm having a difficult time gathering what my thoughts. The publisher's summary is good and probably much better than I could ever write, but it only touches the surface of what this novel is about. At its simplest, LIFE AFTER LIFE tells the story of Ursula Todd, a British woman who was born on a snowy evening in 1910 and immediately died. However, she is also born on that same night and lives! Throughout the course of the next 500 plus pages, Ursula continues to die in a variety of ways; and yet she continually has the opportunity to relive her life -- and thus make different choices. These actions take Ursula on very different paths that ultimately affect her and her loved ones. Unless you're living under a rock, you've read a review or two for LIFE AFTER LIFE. I really can't add anything that hasn't already been said, but I can say that I thought it was brilliant! The premise of this story is pretty darn original (I'm still wondering how in the world the author came up with it), but it's Ms. Atkinson's writing that made this novel outstanding. I have been a big fan of Ms. Atkinson's for some years now, but what she accomplished in LIFE AFTER LIFE is an entirely new level to me! I honestly can't remember the last time a novel made me think this much. Rather, I have decided to focus on the many things in LIFE AFTER LIFE that stood out to me. I've already mentioned that Ms. Atkinson's writing is phenomenal. I adored the story, the way she presented the story, the character development, the humor, the drama, and so much more (truly, I could go on and on), but I also loved that this book incorporated so much of World War II history into it. I had a feeling from the first few pages that the entire story might culminate with WWII, but I had absolutely no idea how much a role it would play in Ursula's life (or lives.) I was extremely impressed with Ms. Atkinson's descriptions of the war and especially the bombings, but I also liked how she showed how much it affected the individuals who were dealing with war in their day-to-day lives. It's been two days since I've finished this novel and I'm still reeling from it. 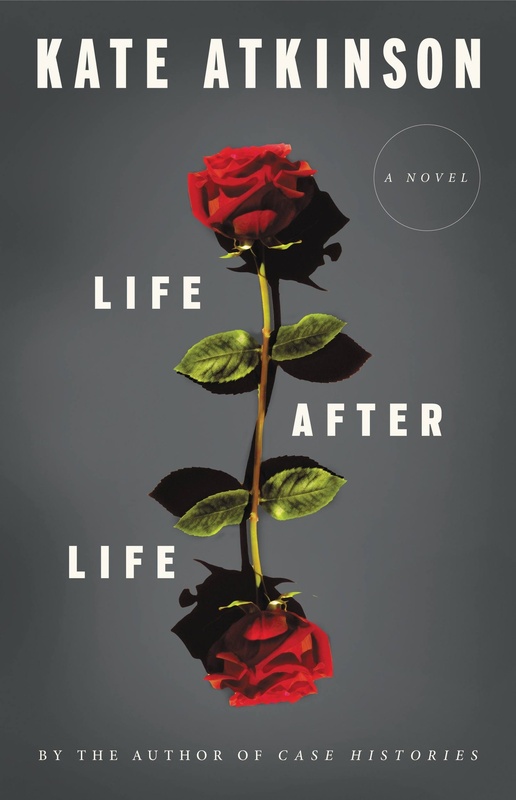 I can't stop thinking about the many messages and themes in this story -- LIFE AFTER LIFE is just one of those novels that begs to be discussed. (Obviously, I'm going to say that it's a great selection for book clubs!) I think there are many incidents in this novel that can be interpreted differently depending on the reader, and that always makes for an interesting discussion. However, the book also explore so many universal themes about life including loss, rebirth, choices, regrets, and second chances. The longer I let LIFE AFTER LIFE percolate in my brain, the more I find that it truly affected me like only a great book can. I have been thinking about choices and how they ultimately affect us, but I've also been thinking about how our choices can affect others -- whether they know it or not -- even after we are gone. I don't particularly like looking back at the past because I can't really change things (and my life is pretty darn good the way it is), but LIFE AFTER LIFE has made me think about how an event (even an especially small one) could have changed life as I know it. And of course, these reflections hold true not only for me personally but also for major world events. Another thing that LIFE AFTER LIFE has made me consider is how much do we affect our lives -- through choices -- and how much do our lives affect us -- through fate. I realize that there is a balance between the two, but Ursula's life experiences made me question how much I can really control in my life. And that's a little scary considering that I'm a bit of a control freak. Similarly, I had to question how much of Ursula's decisions were because of her inner personality traits. Or, were the events that she experienced (in her various lives) a bigger factor in her future actions? There are a few more things that I'm still toying around with, but I think I'll just recommend that you read this novel and see how it affects you! I have a feeling that every reader will take away some different from this story! As I read back over this review, I realize that I hardly did justice to LIFE AFTER LIFE. However, I do hope that I was able to share with you my excitement for this book... and the potential it has to make every reader ponder their own life! I think I'd better make this one of my next reads -- well, sometime next week. The first time I heard about this book was from Jenners who e-mailed me in a frenzy. That is pretty much all I needed to hear. I just have a couple of other books to knock out, then I'm going for it. All these great reviews at once are pretty compelling! And from what you say, yes, it does sound like a great choice for book clubs! I think your review is fantastic - just like the book. My book club did read this book - I'll be posting about it tomorrow. Terrific review, Julie! I have this one on my list and was going to read an earlier book of hers first, but now I'm all fired up to read this one. I've read this brilliant book and your thoughts are spot on!! Awesome review. Man, I need to find time to read this book! So many of my reading friends have read it and loved it!